A3 / A4 Laminator - Rent Laminators. Hire Laminating Machines. We offer A4 / A3 sized Laminators for rent or Laminator Machines for hire. They produce photo quality & there is no carrier pouch required. The Laminating Machines provides crisp, clear images & a professional finish. 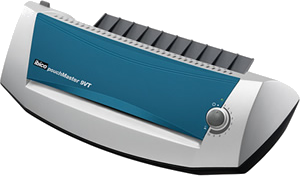 Click on the images or title to go straight to the rental booking page for Laminator Machines.